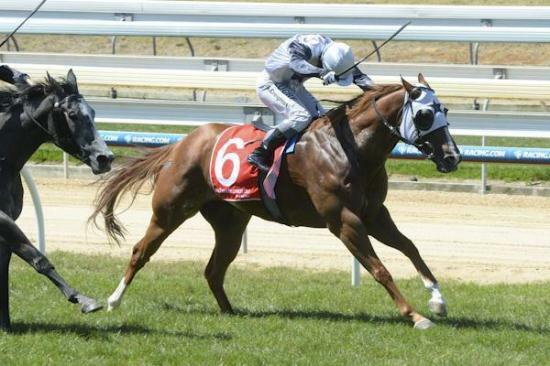 It was a stunning fresh performance by Son Of Sami at Pakenham last Friday, the enigmatic but talented galloper swamping his rivals in the BM64 event to record the third success of his 14 start career. Having his first run since late January, the sparingly raced five-year-old settled wide midfield from a tricky gate, jockey Alan Creighton having him edge closer from the 600m and by the time he turned into the straight he had joined the leaders. Hitting the front a bit early he nevertheless found plenty, much to the surprise of punters who sent him out at the juicy odds of 40-1. It was a satisfying victory for Rick who describes Son Of Sami as "probably one of the hardest horses I have ever had to deal with." A horse who required two surgeries after severely injuring himself kicking a wall during the winter of 2014, Son Of Sami suffers from muscle soreness which makes him "cranky!" "He has always shown ability," Alan Creighton said, "and he travelled sweetly today." "I probably wanted to wait a bit longer but he got there easily. He tired that last 20m but he got the job done." "He is a horse who is hard work every day but so long as he keeps winning races we will put up with him!" he joked. Congratulations to Son Of Sami's patient owners RWH Thoroughbreds (manager Jo M Malloy), R G Webb, M Webb, F H Gibbs, D Spicer, H Barclay, D H Vidovic, A G Heydon, M Albones, A Jones and A L White.